Back and side fat, also called love handles, is a common problem spot. Although you can’t spot reduce a specific area of your body, it is possible to burn fat all over, including your love handle area. Regularly participating in cardio workouts and strength training sessions will help you ditch your love handles. In addition to working out, it’s important to make diet modifications to promote fat loss. Complete at least 150 minutes of moderately-paced cardiovascular activity each week. Select activities that shed the most calories during your workout session. For example, walking at 3.5 mph burns only around 300 calories an hour for a 155-lb. person, but jogging at 5 mph increases the calorie burn to nearly 600 calories an hour. If jogging is uncomfortable, try cycling indoors or out. Pedaling at 12 to 13.9 mph also burns around 600 calories for a 155-lb. person. Organize your own circuit training routine. Start out with a core and back toning exercise, such as the squat with twist. 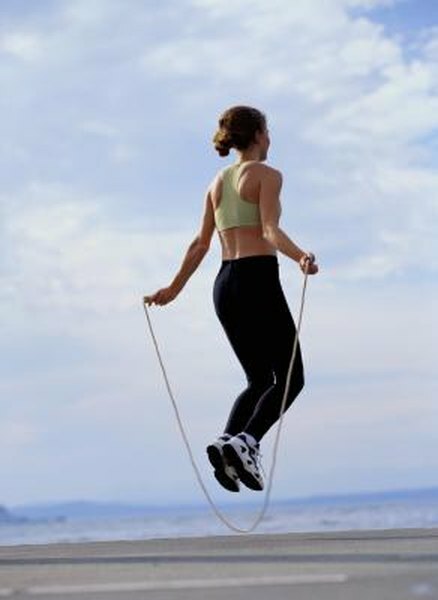 Alternate to a high-intensity cardio activity, such as jumping jacks. Continue to rotate between a new strength training exercise and jumping jacks for at least 30 minutes. Select foods that are low-calorie, yet keep you feeling full, such as foods high in fiber. Eat vegetables, fruits and whole grains. Other good options include lean protein sources, such as legumes, skinless chicken and low-fat dairy products. Tone up with the side crunch. Start out in a kneeling position. Place your weight on the left side and place your left hand on the floor for balance. Slowly extend your right leg to about hip height, keeping your core muscles contracted. Place your hand behind the head and crunch your torso toward the right leg. Repeat the exercise six to eight times on each side. Use the squat with twist exercise to burn fat all over. Start out in a standing position. Spread your feet about shoulder-width apart. Lower into a squat position and twist your upper torso to the right. Use your core muscles to complete the movement. Return to your starting position and complete eight to 12 repetitions on each side of the body. Don’t work your back and core muscles two days in a row. For example, if you work the core and back on Wednesday, wait until at least Friday to work the muscle groups again. Discuss your goals to lose back fat and love handles with your doctor. She will assist with setting healthy goals based on your circumstances.